When we envisage the decomposition of a corpse, the images that probably come to mind are of a rapidly-decayed, foul-smelling body quickly turning to sludge and bones. But there are actually other pathways a body can take following death, some of which can be of great importance in a forensic investigation. I’m namely talking about mummification and adipocere. Thanks to the Ancient Egyptians, we all know about mummification, a particular process of body preservation. When these guys mummified their dead, this routine typically involved the removal of the internal organs, most notably the brain, which was pulled out through the nostrils. Finally, the body would be wrapped in linens and salt and left to dry. The end result would be a remarkably well-preserved body displaying features that would have usually been lost to decomposition. Aside from this especially famous post-mortem ritual, there are actually a number of ways by which a body can become mummified. For instance, more modern intentional mummification would utilise chemicals to preserve the body. But how can mummification occur naturally, and what are the implications of this in a forensic investigation? 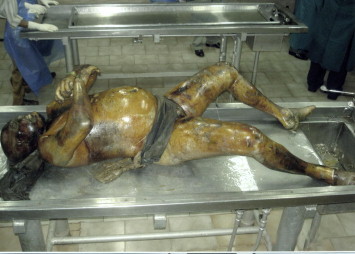 The natural preservation of a cadaver is highly dependent on the surrounding environment, with only very specific conditions causing the body to mummify. A range of factors can play a part in this phenomenon, including temperature, humidity and the action of bacteria and other microorganisms. In hot, dry climates moisture can evaporate from the skin at such an accelerated rate that the process of mummification can occur. As the skin is rapidly dehydrated, it often takes on a dark and leathery appearance. The internal organs may be preserved to an extent, though will typically undergo some level of decomposition so are at least likely to be smaller in size. Hot, dry climates can also hinder bacterial growth, limiting the bacterial decay and further preserving the body. Hot, sandy deserts are perhaps amongst the first scenarios that come to mind when considering mummification, but mummified remains have also be discovered in attics, basements, and even within the walls of buildings. Conversely, especially cold and dry environments can also bring about mummification. The cold temperatures can significantly slow microorganism activity, once again reducing the rate of decomposition and aiding in preservation. A famous example of this is the natural mummy Otzi the Ice Man, believed to have died thousands of years ago but preserved through mummification induced by extremely cold temperatures. Mummifying conditions are not limited to temperature-based factors. Environments of extreme salinity (salt content) can preserve cadavers. The majority of bacteria cannot survive in highly salty conditions, thus severely reducing microbial action on the body. Furthermore salt itself acts as a desiccant on the soft tissue, dehydrating the body and drawing out water much as high temperatures would. An example of this type of mummification was experienced in Iran, where a number of mummies were found in the Chehrabad salt mines. Mummified remains have also been found in bogs or marshland, in which the excess water, organic material and anaerobic (oxygen-free) environment prevents a great deal of bacterial action, thus preserving the body. This is something of a contrast to the typical hot, arid conditions mostly associated with mummified remains, but bogs with particularly acidic water, low temperatures and a lack of oxygen can essentially pickle a body. Thousands of these “bog bodies” have been recovered over the years, perhaps the most famous being the Lindow Man, determined to be the victim of a prehistoric ritual killing. The conditions described may not necessarily induce mummification throughout the entire cadaver, but in some cases may cause localised mummification, if only particular areas of the body are exposed to these conditions. Mummification most often occurs in the face, scalp, chest and back, but typically begins in the extremities such as the fingers and toes. Another phenomenon that can assist in preservation of a cadaver is the formation of adipocere. Known as “grave wax”, this is a soapy, white or grey wax composed primarily of saturated fatty acids such as palmitic and stearic acid formed through the hydrolysis and hydrogentation of body fats (Forbes et al, 2005). Numerous theories have been put forward to suggest how adipocere forms, namely the saponification, hydrogenation and fat migration theories. The type of environment required for adipocere formation is somewhat different from that suitable for mummification. It is often encountered in especially humid graves with little or no air access, thus oxygen-poor, such as a bog or certain bodies of water. The formation of adipocere can take weeks if not years to form depending on the climatic conditions, the rate at which it forms being further affected by the environment and circumstances surrounding the cadaver. Depending on the extent to which it forms, adipocere can produce a waxy layer across the body and act as a barrier against the usual process of decomposition, providing significant protection over time as adipocere itself is fairly resistant to decay. So these are some of the alternative routes of decay a body can take post-mortem. But what does this mean to the forensic scientist? 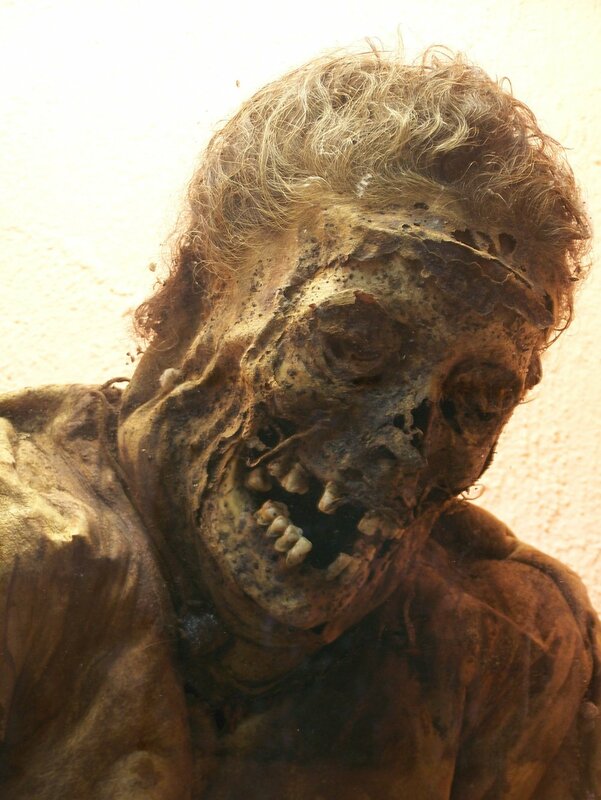 In some cases, the occurrence of mummification or adipocere formation can be of assistance to a forensic investigation, as it may be possible that certain aspects of the deceased person’s appearance and even any injuries they might have acquired will be preserved. Mummified tissues can even be rehydrated to aid in visualising injuries and other distinguishing marks. Similarly, the formation of adipocere can preserve tissues and organs along with recognisable facial characteristics. This can in theory aid in identification if the victim is unknown or even determining cause of death. Furthermore, just as the stage of decomposition of a body can roughly indicate the post-mortem interval (time since death), mummification and adipocere can provide some indication in that a certain amount of time is required for mummification to occur. Approximately 6-12 months are required for the natural mummification of an adult, with a child’s body requiring less time to become mummified (Gitto et al, 2015), though in some cases mummification has been reported in a matter of weeks or even days (Sledzik and Micozzi, 1997). Of course these time periods can vary widely depending on climatic conditions and a number of other factors, but they may provide assistance nonetheless. To an extent it may be possible to determine the rough age of the remains based on the weight of the mummified cadaver, as more recent bodies will be heavier than those which are older and have lost a greater proportion of water content. So given the right conditions, processes such as mummification and adipocere formation can interestingly be a great aid to the forensic investigator. Bereuter, M. T. L. Lorbeer, E. Reiter, C. Seidler, H. Unterdorfer, H. Post-morten alterations of human lipids – part I: evaluation of adipocere formation and mummification by desiccation. Human Mummies. 3 (1996), pp. 265-273. Bryd, J. H. Castner, J. L. 2010. Forensic Entomology: The Utility of Arthropods in Legal Investigations. Boca Raton, Florida: CRC Press. Forbes, S. L. Bent, B. B. Stuart, H. The effect of soil type on adipocere formation. For Sci Int. 154 (2005), pp. 35-43. Gitto, L. Bonaccorso, L. Maiese, A. dell’Aquila, M. Arena, V. Bolino, G. A scream from the past: A multidisciplinary approach in a concealment of a corpse found mummified. Journal of Forensic and Legal Medicine. 32 (2015), pp. 53-58. Kumar, T. S. M. et al. Early adipocere formation: A case report and review of literature. Journal of Forensic and Legal Medicine. 16 (2009), pp. 475-477. Rich, J. Dead, D. E. Powers, R. H. 2005. Forensic Medicine of the Lower Extremity. Totowa, New Jersey: Humana Press Inc.